Max Bracher has kindly contributed this view of NGG16 No.127 on 28 July 2012, as newly delivered to Menzies Creek. No. 127 is a 2'-gauge ex-South African Railways 'NGG16' class Beyer-Garratt locomotive. It was built by Beyer Peacock & Co of Manchester (builder's No.7428 of 1951) a to their "Beyer Garratt" patented design of articulated steam locomotive. No. 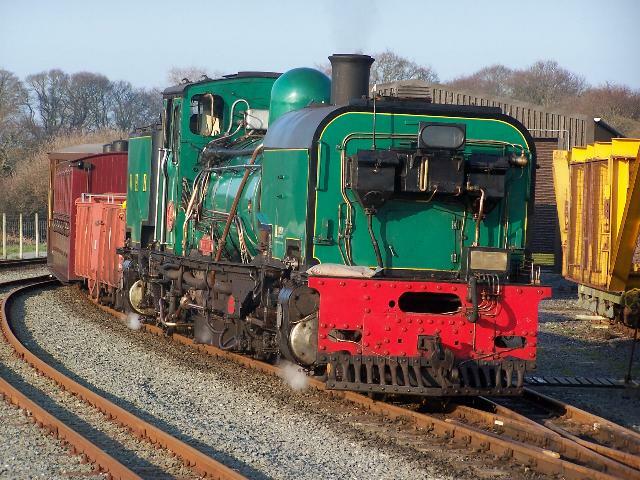 127 was purchased from the South African Railways by the Emerald Tourist Railway Board for the Puffing Billy Railway in late 2011 / early 2012, together with a container load of spare parts stripped from a derelict NGG16, and prepared for transport to Australia. 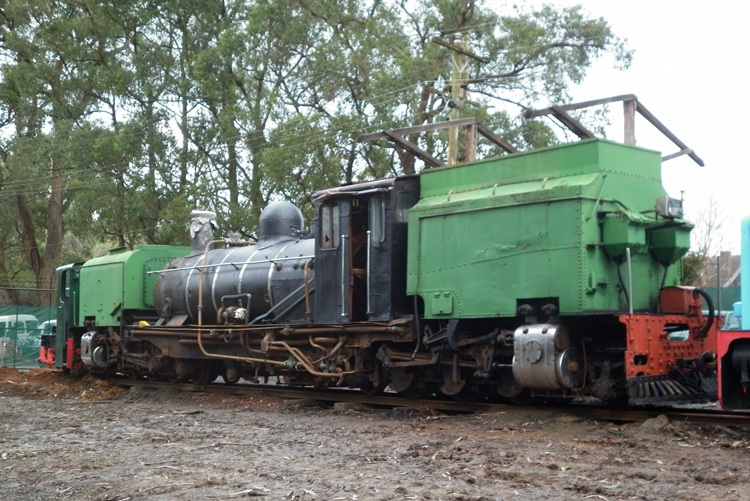 The spare parts will assist in the restoration of sister NGG16 No.129 in the short term, while No.127 will provide the PBR with the option of restoring a second NGG16 at some future stage, if required. 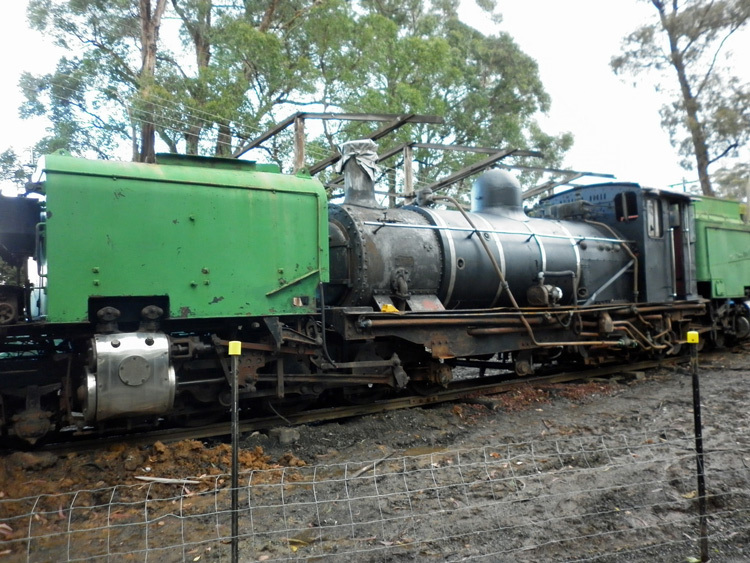 A second view of NGG16 No.127 at Menzies Creek on 28 July 2012, courtesy of Max Bracher. Two images of sister No.138 in steam on the Welsh Highland Railway appear below, to give an impression of an NGG16 locomotive in operation. These images are copyright to Barrie Hughes and originally appeared on his excellent Welsh Highland Railway pages and are reproduced with permission. This view of 19 March 2005 shows sister NGG16 No.138 at Dinas on the Welsh Highland Railway. This image is copyright Barrie Hughes and was captured on a Kodak DX6490 digital camera. Image post processed using Iphoto+4 and displayed at 96dpi. 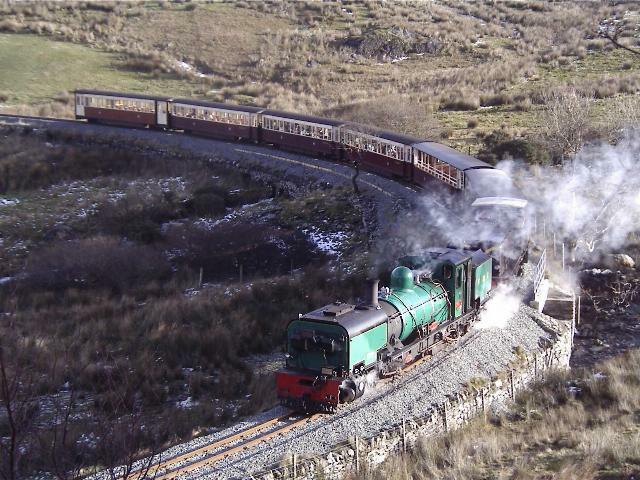 This view of 26 December 2004 shows NGG16 No.138 and diesel Castell Caernarfon at Ffridd Isaf curve on the Welsh Highland Railway. This image is copyright Barrie Hughes and was taken on a Concord 3340z (3.1 Mega pixel) digital camera. a 'Light Railways - Australia's Magazine of Industrial & Narrow Gauge Railways', Number 224, April 2012. Published by Light Railway Research Society of Australia Inc. News item on page 35.